The Beauty Buff Blog: Alice In Wonderland Invades! Have you already marked your calendars on March 5th as a very important date; a very important date that you don’t want to be late for? I have! It’s Alice in Wonderland Day! Tim Burton’s remake of the beloved story is being released and if the movie posters and stills are any indication it will be a cinematic spectacular that only Burton could pull off. I’m not gonna lie, I’m beyond excited! I’m “release of Harry Potter Book Seven” excited, I’m “just got a lifetime supply of Pez” excited, I’m “I just got gussied up to watch the Oscars on my couch with fancy appetizers” excited. You get the point. It’s a dream cast (yet another role Johnny Depp was born to play) and no one can make sensory overload look so good as my favorite eccentric haired director. Minor tangent: Charlie and The Chocolate Factory was a little too out there for me and I’m not sure the masterpiece that is Willy Wonka and The Chocolate Factory needed to be updated. Anyway, before I make this a full on movie review, let me also say how equally thrilled I am by the Alice in Wonderland-inspired accoutrement. The always edgy Urban Decay has come out with a palette of eye shadows called The Book of Shadows. The sixteen eyeshadows, two mini eyeliners and one travel size bottle of the cult classic Eye Shadow Primer Potion come neatly packed in a trippy "hidden" drawer. The shades are all classic Urban Decay colors like Twice Baked, X and Chopper (these only sound normal if you're a UD regular) but renamed for this special occasion in "topsy turvy names" like White Rabbit (actually Polyester Bride), Jabberwocky (Oil Slick) and Queen (Last Call). 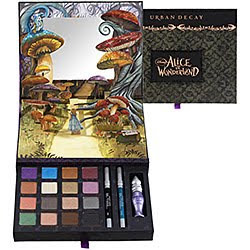 The top of the palette has a pop up scene of Alice in the Mushroom Forest after imbibing the "Drink Me" bottle and becoming entranced by her surroundings, she encounters the hookah-smoking caterpillar. The scene makes you feel like your watching the movie, but the mirror placed inconspicuously in the picture makes you feel like you've been transported into the movie. Um, yes please! 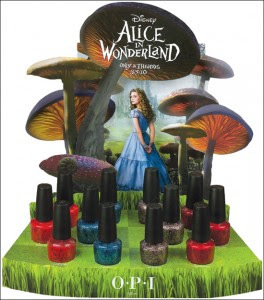 The other Alice-inspired treats come from OPI. The limited edition shades are aptly named Absolutely Alice, Off With Her Red!, Mad As A Hatter, Thanks So Muchness! Absolutely Alice (a sky sparkly blue), Off With Her Red (you guessed it, a orangy crimson), Mad As A Hatter (a party in a bottle of party confetti in varying shades), and Thanks So Muchness! ( a shimmery metallic berry red) are not only super festive but also an innocent way to conjure up the Alice, Red Queen, Mad Hatter, White Rabbit and Cheshire Cat in the comfort of your own home. I'm most excited about the pure sparkly decadence that is Mad Hatter. 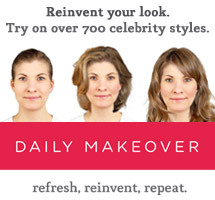 The collection can be found at your local salons and many beauty store locations. Enjoy and I'll see you all in the theatre, March 5th!